Hill & Hole has been included in The Listener’s list of Top 50 Kids Books AND the New Zealand Herald’s Canvas magazine’s Best Books List … just in time for Christmas! Lucky me! My advance copies of Three Cheers for No-Ears just arrived the other day. They’re looking splendid! It’s also being released in Te Reo, which is exciting. 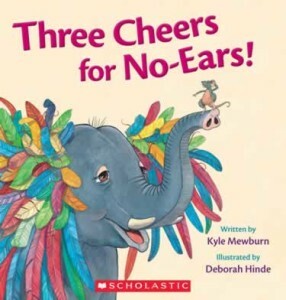 The story is about an elephant who discovers having tiny ears can be very handy. It’s a funny story with lovely illustrations by Deb Hinde, who also illustrated The Hoppleplop and The Bear in the Room Next Door many years ago. It’s being released in January, so start saving your pennies! Filed Under: The Bear in the Room Next Door, The Hoppleplop, Three Cheers for No-Ears! If you buy one of my books through a link on this website I receive a 5% commission. This is a great help to me in being able to write more books.